MBA elective celebrating its fifth successful year at Cass. 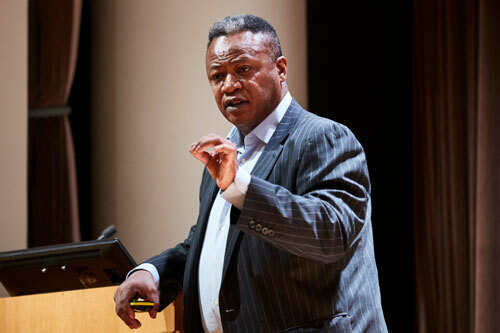 Speaking in London’s prestigious The National Gallery was James Chew, on ‘How networks built a national investment company’. He said, "We needed to scrap the old model of short-term serial investments and get closer to businesses. We actually built a physical network of branches across the UK, despite living in a digital age." BGF’s networks are crucial to their success. They employ around 160 people but they leveraged their connections in order to scale up and deliver impact, for example, they can have a 3,000-strong talent network across the UK. We co-opted people to ensure our networks work this had to be collaborative capitalism. Next on stage was returning speaker and brand expert Markus Kramer, who combines decades of deep client-side experience working in leading marketing positions for brands such as Harley-Davidson and Aston Martin. He is also a Senior Honorary Visiting Fellow at Cass. In his talk ‘Exploring the World Through the Lens of Luxury’, he said, "There’s a lot that we can learn from the luxury goods sector. Luxury brands create value that commands huge monetary worth." The global luxury market is worth around €3 trillion and is still growing. Markus added, "The sector has grown faster than many others, post-financial crisis." René Carayol is a renowned speaker, leadership guru, writer, broadcaster and author and an Honorary Visiting Professor at Cass. 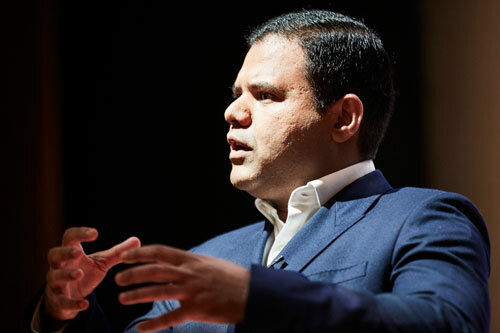 He focuses on inspirational leadership and high performing cultures, bound together with his compelling ‘spike’ philosophy founded on his own board level experience. A leader who listens and builds a collaborative working environment always inspires their staff to go the extra mile. On the current leadership models, he said, "Nothing is best done alone anymore and the days of the boss knowing everything are gone. Hierarchies are failing to deliver in today’s businesses." 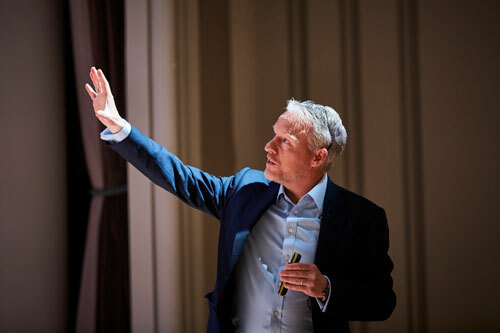 Drawing on decades of experience and examples of the effectiveness of collaborative leadership, Rene delivered an energetic and inspiring session that delivered a simple call to action: create connections, create engagement and create trust. René believes that organisations work best when team members not only collaborate but work to their individual strengths. He encouraged people to think about their specialisms and concentrate on exceeding in those areas. He said, "You don’t need to be a generalist. Rather than be mediocre at everything, become brilliant at two or three things and then collaborate with others who bring different expertise to the table. Be unique, special and different." The last speaker of the fifth MBA Symposium was Deputy Mayor of London for Business, Rajesh Agrawal. Being open and entrepreneurial is built into London’s DNA. Closing the day’s events, he spoke about how London has always been a city of opportunities. He said, "Businesses and investors flock to London because it is a hub for talent across sectors. Education in collaboration with skills development is the key to employability. But it’s not just about jobs for today, but also for tomorrow." He spoke about how London’s talent-network is leading global innovation during a time of fast-paced disruption. He added, "London is collaborating with other cities to lend its expertise worldwide." The Symposium is an elective element of the MBA course which brings together over 150 students from all Cass MBA cohorts, as well as MBA teams from partner schools in South Africa and Europe.